From September 2014 to April 2017, ten groups of trainees employed through the Employment Training Unit (ETU) at Falkirk Council, each undertook a thirteen week block of practical work based training on sites within the IFLI area. Supervised by experienced staff from The Conservation Volunteers (TCV), participants gained experience and recognised qualifications in countryside and land management. Project sites throughout the Inner Forth were used as ‘training grounds’, adding value to the range of work already planned through ‘Conserving & Restoring’ projects. 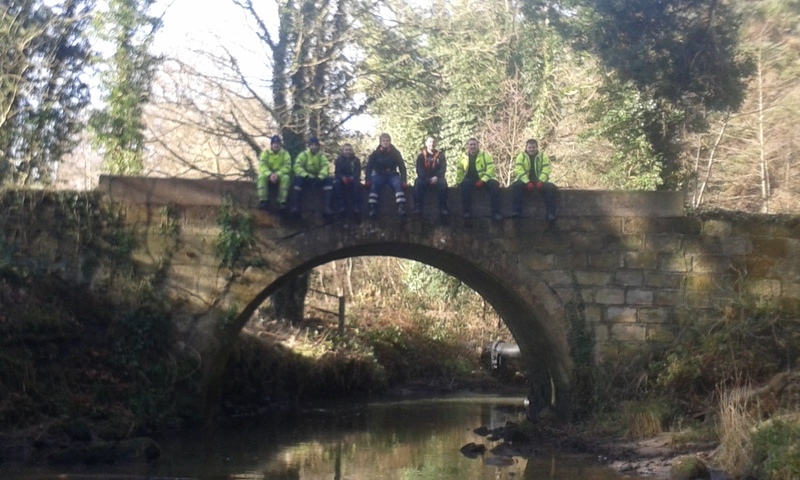 Trainees gained experience in skills such as scrub clearance, tree works, path building, fencing and brushcutting. Each group of trainees for this project were recruited and supported by Falkirk ETU to progress through the Council’s 5-tier Employability Pipeline towards sustainable employment. All trainees were entered for Falkirk’s nationally recognised Employability Award, which is made up of ten SQA employability and core skills units at SCQF level 4 and demonstrates the trainee is ‘work ready’. Day to day supervision of the trainees and creation of the training and works programme was undertaken by The Conservation Volunteers (TCV). Take a look at the gallery below to see IFLI Landscape Management Trainees working on IFLI sites. Reports from each complete group are available to download at the bottom of this page. 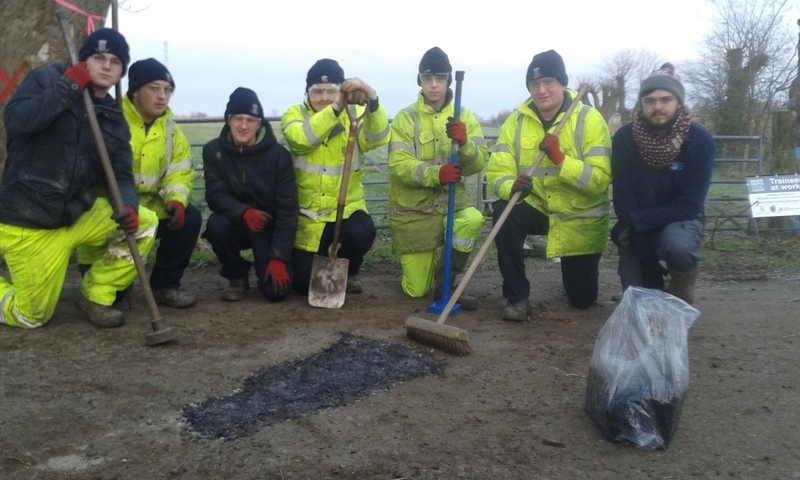 Seven trainees took part in the tenth and final Landscape Management Trainees group. The group worked in Stirling, Falkirk and Fife on a range of projects that developed their personal and employability skills for the future. This group carried out work as diverse as planting 300 trees at Polmont Woods in Falkirk to upgrading paths and steps at Forestry Commission Scotland sites at Balgownie Woods and Devilla Forest in Fife. The work at Polmont Woods has contirbuted to this IFLI project. Throughout the ten groups it has become clear that in addition to benefitting trainee's development, their work has benefitted places, people and habitats around the Inner Forth, including where IFLI partners and other stakeholders in the landscape have been delivering work. On a number of sites trainees have been making positive changes that will be felt into the future. A favourite example is at SWT's Jupiter Urban Wildlife Reserve where over a number of trainee cycles a site for TCV's new growing project has been developed. Trainees built raised beds and had a huge part in creating a new woodworking shed clad with pallet wood. Windows were put in and work benches built to the trainee's own designs. Wester Moss (left) and Jupiter Urban Wildlife Reserve (right). The group were back at Jupiter Urban Wildlife Reserve in Grangemouth to construct two new fruit cages and building raised beds that will be used by a project at the site focused on local food growing. Time was also spend at Wester Moss SSSI, a Butterfly Conservation Scotland reserve by Fallin near Stirling. Work here involved removing previously cut brash from the peatland site and stacking it in habitat piles. Over the three months the trainees worked on six different sites. They upgraded 300m of pathway, planted 60 native trees and constructed 8 large raised beds! Congratulations to the trainees and best wishes from all at IFLI for your next steps. This group of trainees has enjoyed a diverse range of works throughout the IFLI area, with four moving into jobs or apprenticeships along the way. Trainees have worked with the RSPB wardens at Kinneil Lagoons near Falkirk to cut back encroaching trees from the edge of the water, learning how to safely fell trees and see chainsaws being used. They worked in Fife at the Forestry Commission’s Balgownie Woods. 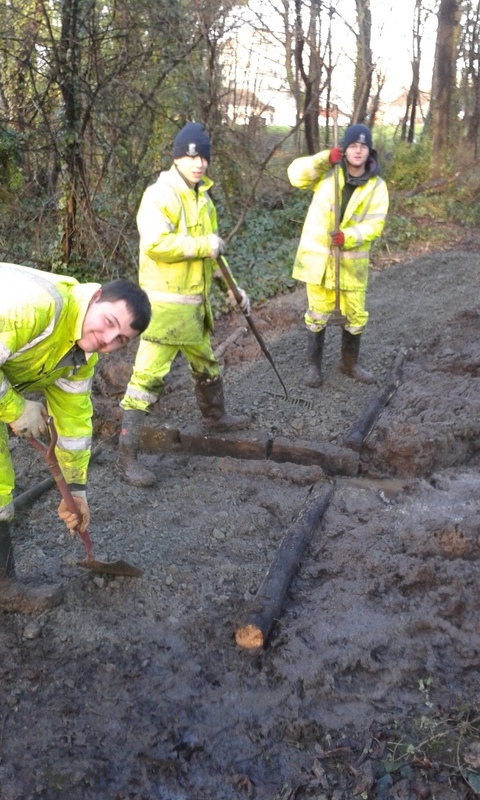 Here they undertook footpath repair and maintenance, tree thinning and drain construction. They enjoyed the work here as it allowed them to visit somewhere further afield than usual. Quite a bit of work took place at the SWT’s Jupiter Urban Wildlife Reserve in Grangemouth to accommodate wheelchair users on a more regular basis and to increase capacity for future food growing projects. The trainees stripped out all of the old raised beds, rebuilding them in more accessible positions, made alterations to turn two old polytunnels into fruit cages and lastly resurfaced the areas around the new raised beds. The full group report can be downloaded from the bottom of this page. Digging a post hole at Bo'ness Foreshore to install an interpretation panel and measuring up for cutting timber at SWT Jupiter. The seven trainees who took part in this thirteen week programme have all moved on to positive destinations, great news for the young people as summer starts. Their next steps range from a plumbing apprenticeship to private landscapers. An interesting and new project for the trainees was to install two tern rafts at the lagoons at Bothkenner just back from the River Forth where the River Carron meets. The site is well known for Common Tern and the idea was to improve their habitat by adding two manmade islands in the centre of the lagoons. The rafts themselves are recycled plastic boxes the size of a bed, filled with polystyrene and with a layer of gravel on top. Ali and the trainees didn’t know how deep the lagoons were or what the ground was like under the water so the decision was taken to tow them out using open canoes powered by IFLI trainees. The project itself went very well and all the trainees thoroughly enjoyed it and were proud of their work: months later they still talk about it, wondering if there are Terns nesting on their islands. All the trainees took shots in the canoes towing out the rafts and dropping the anchors that were made from old plant pots filled with concrete tied on by thick rope. The more brave and intrepid trainees all volunteered first with the more cautious ones holding back, but as the week went on one by one they all took a turn and came back in with a big grin on their face saying it wasn’t scary at all and that it was really fun. Out in all weather, this group of trainees worked on eleven different sites throughout the four local authority areas that the IFLI area covers. Key themes for this team were tacking drainage issues at Lady's Well in Tullibody; removal of Sea buckthorn from areas of the island at the Kinneil Local Nature Reserve by Bo'ness; and a good number of projects involving tree works of differing types. At Wester Moss in Stirling, the team spent a number of days cutting back trees that were encroaching on the bog. This will ultimately help with retention of water on the SSSI site. The trees were later tucked into the woodland, off the bog by a Butterfly Conservation workparty - you can see photos of this day on the IFLI facebook page. A project that the trainees really enjoyed was to transplant saplings from the woods infront of Gean House and replant them at Cambus Woods in Alloa. The group removed and replanted Beech, Ash, Holly, Cherry and Yew, building on their tree identifiication knowledge along the way. The young trees will benefit their new site by providing a greater age diversity in the woodland. As part of IFLI's 'A Fruitful Landscape' project, Emilie Wadsworth of CSGNT invited the trainees to reinstate part of the old orchard site at Cambuskenneth Abbey near Stirling. The area south-west of the bell tower appears to have always been used as an open space or orchard/garden, as is shown on old maps such as the First Edition Ordnance Survey Map of 1863 (see below). Over a two week period, twenty one apple, pear and plum trees of heritage varieties were planted on the site and stock-proof fencing for each tree was installed. The trainees used their hand tool skills and the electric saw to build the robust frames with wood and wire that surround each tree. 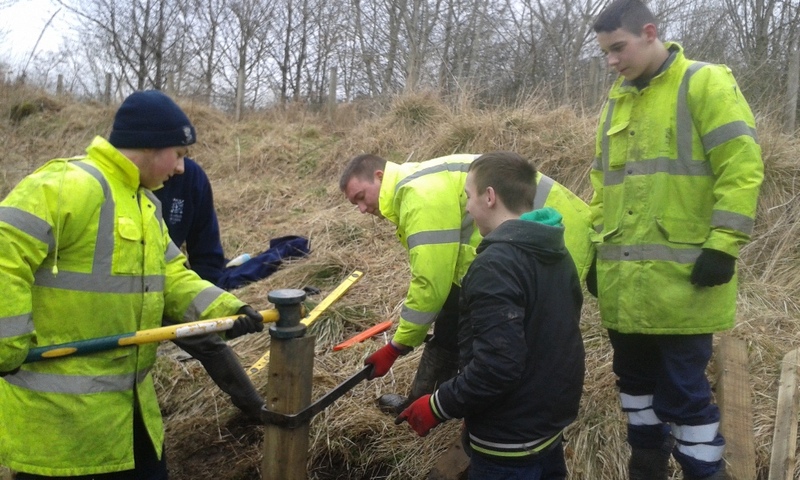 This group marks the halfway stage of the project, and again the trainees are developing new skills for future employment on a variety of IFLI project sites and greenspaces around the Inner Forth. As this group comes to a close, their supervisor, Ali Lawson explained where the group has worked: "The work we have been doing at Charlestown in Fife has been really interesting for the boys, working on top of the best preserved Limekilns in Scotland. We have almost finished clearing on top of the kilns and the team have worked very hard to achieve this. We still have some days to finish off which the lads are looking forward to. We have back down Kinneil foreshore in Falkirk tackling the Sea buckthorn that is widespread. The wet weather has shown up a few problems with the paths down there so the trainees have spent a few days clearing out the rain bars and patching up the paths." In November, Ali from TCV who supervises the trainees day to day and programmes their work, shared details of a recent job: "Shiresmill Woods was a woodland thinning project that we completed a month ago now... The main part of our work was spent in the sensory riding area where users of the RDA Therapy Riding Centre are taken on horseback around a weaving network of paths in a small area of woodland. Our job was to thin the woodland blocks out slightly to allow more light through the trees and to cut back any branches that were over hanging the pathways to make it safer for riders." The group, which finishes at the end of the year has also worked at Tamfourhill in Falkirk on part of the Antonine Wall. Ali says, "We have been taking down everything in and on the side of the ditch; small trees, Rhody, brambles and ferns. The aim is the open up the ditch more, stop it becoming totally overgrown and allow visitors to see the scale of what it once would have been." This group of trainees had a fantastic opportunity to contribute to the early stages of the IFLI project taking place at Kennetpans distillery. Their task was to remove the layers of ivy (at a low level) that have grown over the structure, shielding much of the building from sight. This work has uncovered parts of the building and will help Historic Scotland staff and other professionals involved in the project here, get close to the walls to carry out surveys and identify how to consolidate the structure. Their second historical themed site was at the Limekilns in Charlestown, Fife. Here, the trainees were responsible for removing an area of scrub and small trees that has grown up over the top of the limekilns. Again, this was to uncover the structure and assist Historic Scotland and other project partners in seeing what was under the mass of vegetation. As the report available from the bottom of the page explains, the group had to decide what to do with the vegetation they had removed. They chose to build dead hedges around a number of firepits and holes that they had discovered - a great way to provide shelter for small birds and keep human visitors safe! Left, Trainees working to remove ivy at kennetpans distillery. Right, trainees creating dead hedges at the limekilns at Charlestown. Group 3, April 2015 to July 2015. Group 3 started work on 7th April and spent their first week in Falkirk at RSPB Skinflats and in Stirling at Fallin Bing. This group includes some trainees from group 2 and some new trainees as the programme has developed to work at Stage 4 level. This provides an excellent opportunity for trainees to have longer to develop their skills and benefit from additional practical training. At RSPB Skinflats the group worked alongside the site warden to repair the banking at an outflow pipe adjacent to the reserve boundary. This involved driving upright stakes into the mud then weaving bundles of brash in between the uprights. Over time, the brash will collect sediment and mud from the rise and fall of the tide, naturally repairing the bank. This traditional conservation method has been used around the Forth and on many other rivers throughout the UK. To find out more about work undertaken by this group of trainees, you can download the group report from the bottom of this page. The trainees visited sites on both sides of the Forth during their works programme. They have undertaken jobs as diverse at filling pot holes with tarmac to path drainage works, from hedgerow planting to brushcutting. They got on well as a team of seven a number are finished their Falkirk Employability Award. Congratulations to team members who are moving on to various employment, including grass cutting contracts, a Modern Apprenticeship and furniture repair. You can download the report from the bottom of this webpage. This group has now completed their 13 weeks with the Inner Forth Landscape Initiative. You can download the report from the bottom of this webpage. The IFLI team would like to thank Graeme, Sandra and Ali at TCV, Ian, Elaine and Kim at Falkirk Council ETU and various participating land managers and site staff for their ongoing support with this project. Find out more about Falkirk Council. Find out more about The Conservation Volunteers (TCV).